Last year, I decided to visit Vietnam for the end of the year, partially because my 30-day visa into Thailand was expiring and because I was hoping to see some good fireworks. Without a lot of research, I flew into the Vietnamese capital on the 31st from Bangkok. While there were quite a few celebrations, they were sadly underwhelming. 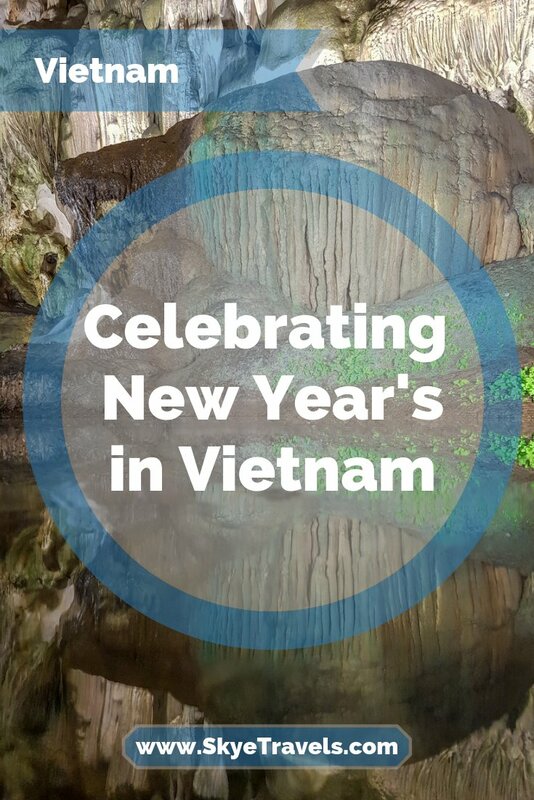 Here’s my experience and what to expect with New Year’s in Vietnam. Vietnam is one of the last five communist countries in the world. Knowing that, I wasn’t sure what I would find in terms of celebrations there. The only other communist country I’ve explored is Laos, and the locals there didn’t really seem to be the partying type. After a few hours in Vietnam, I found the locals certainly liked to party, but New Year’s isn’t the celebration it is in other countries. Actually, there’s a point that needs clarification here. When I say New Year’s, I’m referring to the Gregorian calendar that we use in the West. Since 1954, Vietnam has used the Gregorian calendar for dates, but also uses their own lunisolar calendar (based on the moon and sun) to observe holidays and celebrations. So although administratively they entered 2019 on January 1st, they celebrate their New Year on February 5th. The exact date changes each year based on the moon. It coincides with the Chinese New Year, but the locals are quick to point out that their calendar is their own, not Chinese. New Year’s in Vietnam is called Tết. It doesn’t enter a new calendar year, but rather signifies a new year of life. Aside from the celebrations, traditions include starting a new business, cleaning the house completely, renewing friendships by visiting them at their home, etc. It sounds like a really great time to visit, except that it’s the one holiday that everyone in the country observes (especially those who work every other day of the year), and thus most businesses are closed. Quite similar to when I visited Turkey during Ramadan and nothing was open. I asked my hostel manager if there were going to be any fireworks and where to see them from. She didn’t know if there was going to be a celebration but said that Hoan Kiem Lake would probably be a good option. With a few hours to spare before midnight, I made my way into the center of town. It took a bit longer than it should have, not because of traffic, but because I accidentally jumped on the wrong bus and had to get another to take me toward the city center. 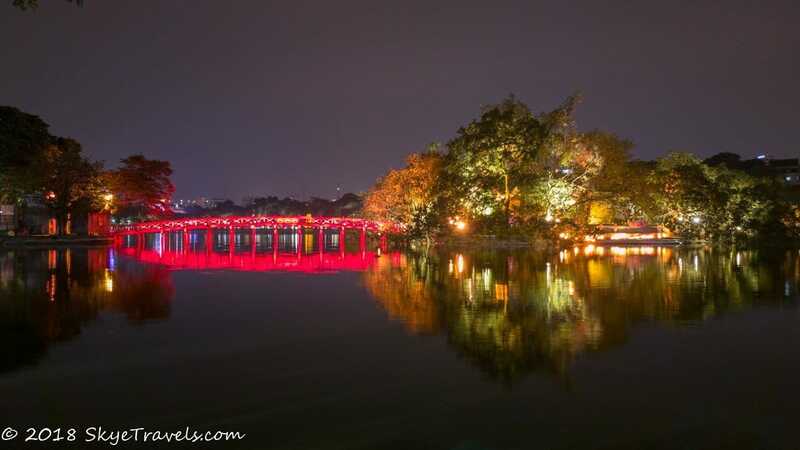 Hoan Kiem Lake is a freshwater lake about half a mile long in the center of the Historic Old Quarter of Hanoi. At the top of the lake is Dong Kinh Nghia Thuc Square, the heart of the Old Town. In the center of the square, a massive band stage had been set up with different bands playing songs in both English and Vietnamese. Unfortunately they were experiencing some technical difficulties, and the sound cut out a couple times shortly after I arrived. I wanted to use the lake to get a reflection of the fireworks, but the problem was I didn’t know where they would be set off from. I figured they might be launched from the island on which Ngoc Son Temple sits, not far from the central square, so I started walking around the lake to see if I could get a good angle. Halfway down the east side of the lake, I ran into another band stage, this one with a far larger crowd. I tried to wiggle my way through, but the press of bodies was too thick. The music was better here, but I would never have been able to hold my camera steady to capture the fireworks, let alone set up my tripod. I retraced my steps to the central square and tried the other side of the lake. The crowd here was much more sparse. After picking up some ice cream (for about $0.25), I found a spot on the bank of the lake where the trees parted enough to give me a clear view of Ngoc Song Temple as well as the band stage on the far side of the lake. The main square was partially obscured by the overhanging trees, but I didn’t think they would be launching the fireworks directly over the crowd and the town. Finally, just before midnight, the band started playing a rather horrible version of Europe’s The Final Countdown. Then they chanted down in Vietnamese as we approached the final seconds until the New Year. As the clock struck 12, a few fireworks were fired off above the stage I was watching, and a few more behind it, presumably from the river a mile or so away. There were a few more fireworks launched from the main stage and they were the kind you often see launched from someone’s back yard. A few were shot off in a measured beat, and then three more all at once as the show’s finale! To say I was disappointed would be an understatement. As soon as the fireworks were done (at roughly 12:01.15 a.m.), the crowds began to disperse. 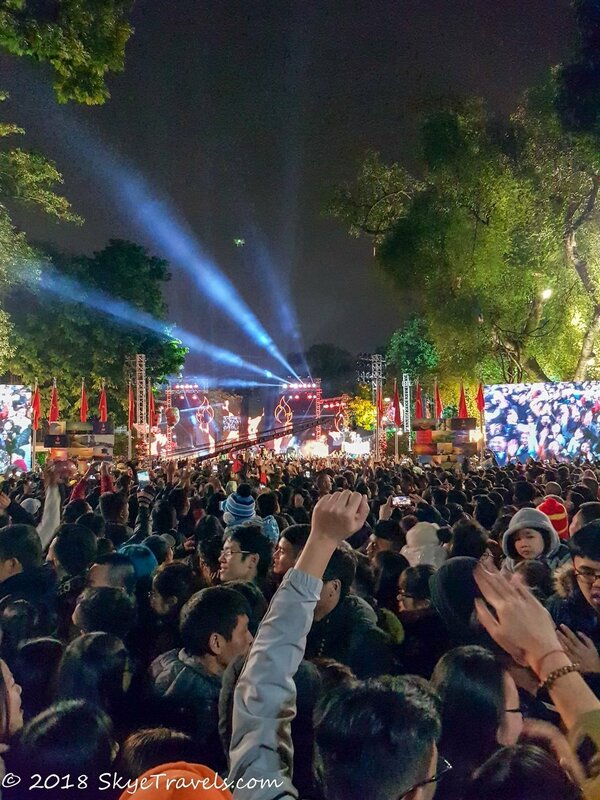 Clearly, the New Year’s celebration of the Gregorian calendar is not a big deal in Vietnam…or at least in Hanoi. I’ve heard that the festivities and fireworks down in Ho Chi Min City (Saigon) are a bit better, but I think I’ll skip that one next year. There are far better displays around the world, not the least of which is the epic Hogmanay celebration in Edinburgh which was lucky enough to attend last year. Hogmanay is certainly one of the most impressive New Year’s Eve celebrations in the world. After setting the world record for the largest New Year’s Eve party in 1997 with over 400,000 in attendance, they’ve limited the number of tickets while seriously improving the quality of events. It’s now three days of fun and festivities, including the torchlight procession on the 30th, several bands, parties, ceilidhs (a Scottish folk dance) and a fireworks show on the 31st. Then there’s the Loony Dook on the 1st where over 1000 “loonies” jump into the freezing Forth of Firth (the bay Edinburgh is on). Hogmanay is the only really impressive New Year’s Eve show that I’ve been too, although the fireworks from the Space Needle in Seattle (which I’ve now seen twice) weren’t that bad. However, there are a couple shows I’ve watched on YouTube that really look fantastic. The first is Sydney, where the entire bridge and harbor go ablaze with thousands of fireworks getting lit off. The second is Dubai, where they use the Burj Khalifa (the tallest building in the world) as a backdrop for a massive fireworks and laser show, not to mention the entire building is covered in LED lights and provides a show in itself. Someday I hope to see these two shows and many more around the world, but I never really plan that far ahead. If you know of more shows I should be putting on my itinerary, please let me know.